When I saw that ThinkFun had started a Kickstarter for Roller Coaster Challenge, a brain-teaser game that lets you build your own roller coasters, my only question was what I should pick for my backing level. Should I just get the base game, or spring for the extra challenges and bonus car? My geekling is a budding roller-coaster enthusiast who also loves the challenges from Robot Turtles, another critical-thinking and logic game from ThinkFun, and this game had her at the words “roller coaster.” At the ripe age of five, she has gleefully conquered every coaster she can ride—including Expedition Everest at Disney World, which goes backwards—and bemoans not being tall enough to ride others (48 inches seems to be the magic number for Valleyfair). Given this enthusiasm, I decided to spring for the add-ons. It’s a great day when something you backed on Kickstarter arrives as expected! When the game arrived and my daughter saw the cover, she instantly wanted to get it out and play a round. It comes with a game grid (a base board with a 5-by-5 grid), a roller-coaster car, 36 post pieces, 2 tunnel pieces, and 39 track pieces. Among the track pieces are a number of turns, connecting pieces in a variety of lengths and drops, and a loop-the-loop. 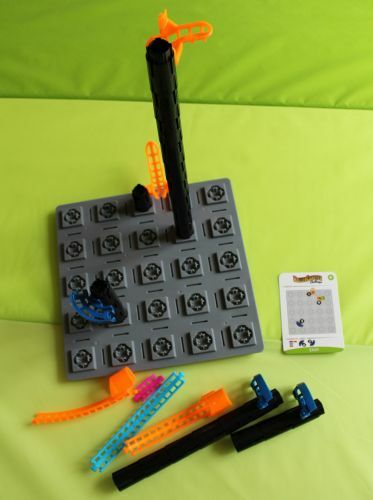 There are also specialized beginning and ending pieces and a deck of 40 challenges to solve, rated from “easy” to “super hard.” The starting, ending, and curved pieces are all designed to connect to post pieces, which are stacked give the height needed; the track pieces then connect between these points. While nearly all components are made out of plastic (the exceptions are two durable cardboard arches and the metal ball bearing in the car), the track elements’ softer plastic will hopefully be forgiving to the actions of enthusiastic track engineers. While we’ve had little problem in disassembling the tracks, assembling can be a bit trickier, especially if it’s the first time a specific piece is being used. We’ve discovered that rolling a piece in works a bit better than trying to push something straight down; too much downward force can collapse an in-progress coaster (much to my daughter’s frustration) or potentially damage pieces. As far as durability goes, we’ve had little complaint. 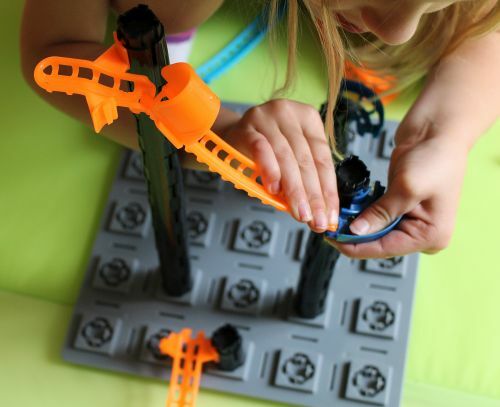 The only problem we’ve encountered is with the roller-coaster car that came with the game—the two parts surrounding the ball bearing like to come apart. But a bit of careful glue application will likely fix that, and the second car I received as a Kickstarter reward doesn’t seem to have the same problem. The solution’s on the back! 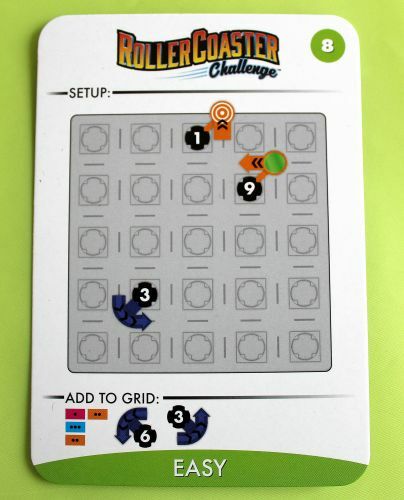 The game has two modes: players can either attempt to solve one of the challenge cards or free-build roller coasters using the various pieces. “Sandbox” mode isn’t something that’s usually found in board games, so it’s nice to know that Roller Coaster Challenge will have some repeat playability once my kidlet works her way through all the challenges. The challenges come in the form of a deck of challenge cards, which have the setup on one side and the solution on the reverse. The setup side shows an image of the game grid that indicates three-dimensional placement of the starting and ending pieces and any other pieces required for setup, along with the components the player must use to complete the track and solve the puzzle. All set up and ready to solve! After having completed most of the easy challenges, my daughter is still enjoying the game. Since she’s about a month under the recommended age range for the game (6 and up), she may need more hints from Mom as we get into the tougher challenges, but there will still be something for her to learn even with assistance. From an adult point of view, none of the “super hard” challenges have been particularly difficult, so the challenges may not be as fun for someone of middle-school age or older. However, this adult, at least, still finds it fun to make her own coaster and send the car careening down the track, so the game isn’t completely unattractive to all older players (especially if they had way too much playing Roller Coaster Tycoon when they were younger . . . not that I’m admitting anything). Having had the game for a few months now, I’m glad I backed the Kickstarter. It’s looking to be a great tool for helping my daughter develop problem-solving and deductive skills while being the most fun 3D game since Star Trek introduced 3D chess. My only regret is that I didn’t grab the add-on of additional post pieces—more post pieces equals taller and longer coasters. The car really moves on a finished coaster! Roller Coaster Challenge retails for $29.99 and is available on Amazon. As an impressionable middle schooler, Rae was led to the geek side through family traditions and Science Olympiad team members. It spiraled from there. In addition to Twin Cities Geek, she writes about life, passions, geekdom, parenting, and more at Starship Suburbia.